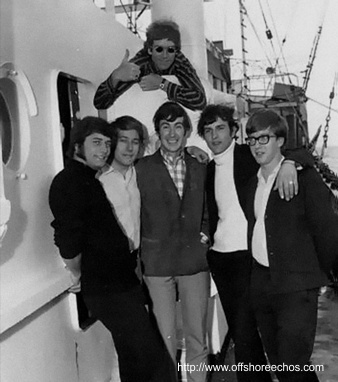 Early August, saw Radio Caroline broadcasting twenty-four hours a day. 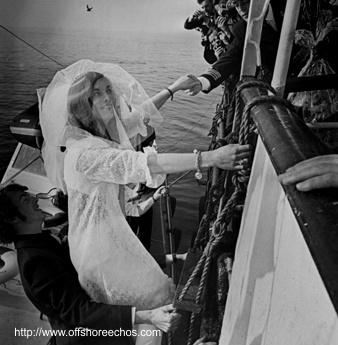 It has long been a tradition that a ships Captain can carry out a marriage ceremony. 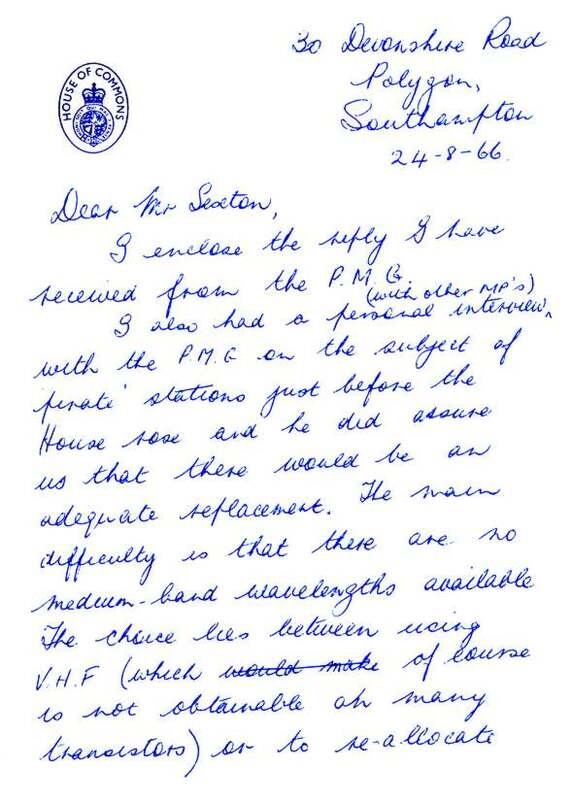 On 20th September 1966, the Captain of the MV Caroline - a Panamanian registered ship - was called to carry out this duty. 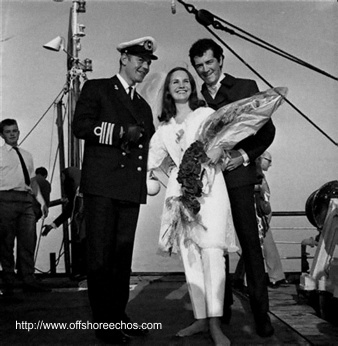 Captain Martin Gips, in a borrowed coast guard uniform, conducted the marriage of deejay Mick Luvzit to Janet Teret, former Caroline North DJ, Ray Teret's sister. The ten minute ceremony was broadcast live to Caroline's estimated six million listeners. At the end of 1966, Mrs B. Braddock, a Labour member of Parliament, launched an appeal on Caroline North, for the Aberfan Disaster Appeal. She raised £8,100 and presented it to Mr Cledwyn Hughes, Secretary of State for Wales. During December, Caroline's head Ronan O'Rahilly tried, without success, to arrange a meeting with the British Postmaster General, Mr Edward Short, on board the MV Caroline. In mid December, Caroline North changed frequency to 257 Metres / 1169 Khz, although this was announced as 259 Metres. At the end of 1966, director Barry Ainley resigned, leaving Ronan O'Rahilly and Philip Solomon as joint managing directors. In February 1967, Radio Caroline admitted that it was operating a payola system. For £100, a record not in the Top 50 would be "plugged" for two weeks. Most of the other offshore stations, were operating some form of paid airplay, either directly or indirectly. It should also not be forgotten that Radio Luxembourg's programmes were sponsored by the four main UK record labels - the reason Caroline was started in the first place. 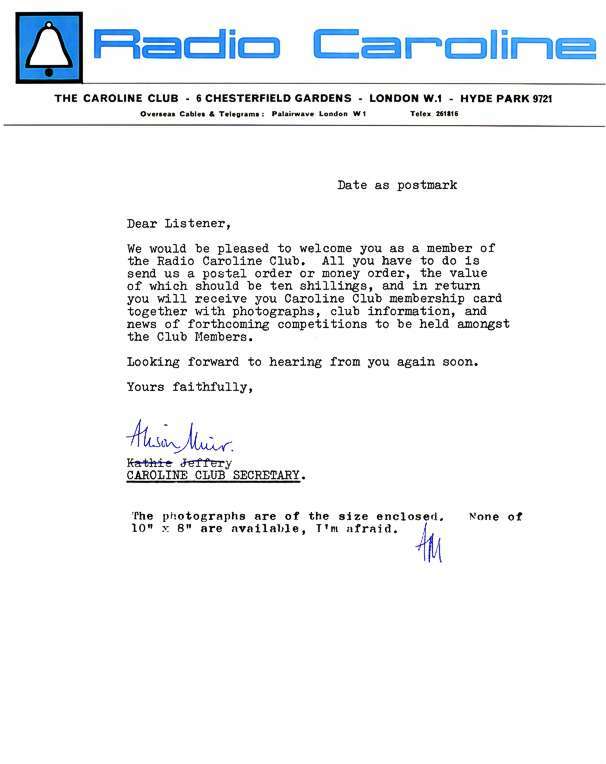 During April, the Caroline Club announced that membership was in excess of 60,000 worldwide. 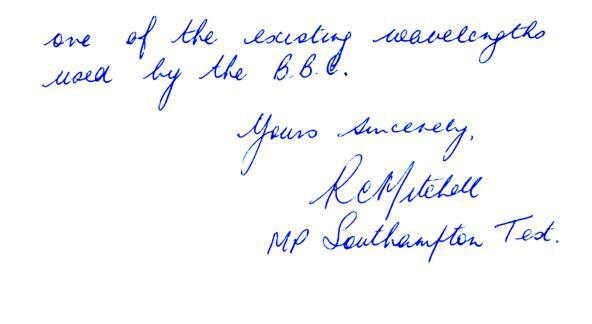 With the Marine Etc Broadcasting (Offences) Bill, being debated in parliament and due to come into force in August, Radio Caroline opened offices in Amsterdam, Dublin, Paris, Toronto and New York. The Amsterdam office was situated at Singel 160, and was run by a South African, Basil van Rensburg. He announced that Dutch language programmes would commence after the installation of a second transmitter. 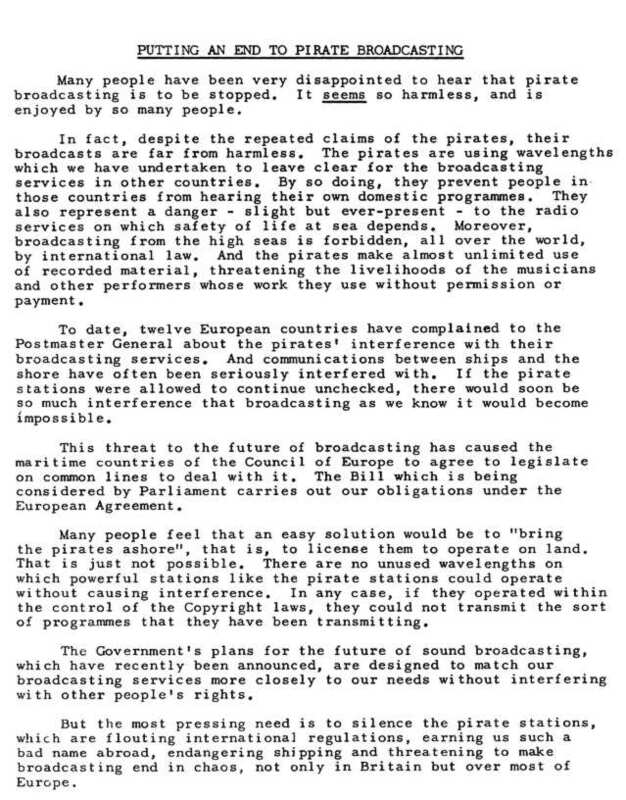 He also stated that after the Marine Broadcasting Offences Bill became law, records would be supplied by Dutch and American record companies and the Dutch agents of British record artists. Ronan O'Rahilly toured most of Europe seeking advertising. In France, he met representatives of Services et Methodes, a public relations firm used by General de Gaulle. In Canada, advertising was sought through Toronto based Masirah Associates, run by Englishman Terry Bate. During August 1966 Ronan O'Rahilly had persuaded him to leave the Canadian Broadcasting Service and act as a consultant to Radio Caroline on a seven year contract. In June, poet and dramatist, Ronald Duncan, founder of the English Stage Company, stated in the Daily Telegraph that he would write and supply scripts to the offshore stations once they became illegal. 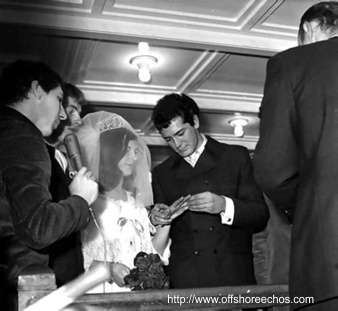 The same month also saw Caroline director and owner of Major Minor Records - Philip Solomon, become an Irish citizen. All the other British directors resigned at this time.